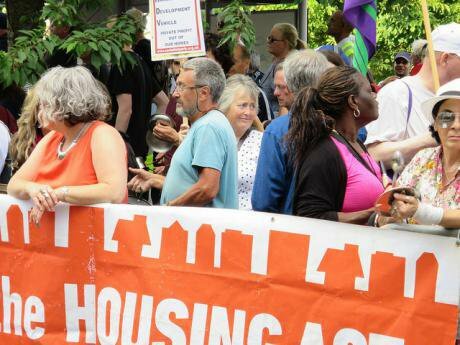 This week's resignation of Haringey leader Claire Kober shows that Labour councillors can no longer get away with carving up estates and giving them to developers like LendLease, but must embrace more radical housing policies. Image: Protest in Haringey in July 2017 against the HDV. Flickr/Alan Stanton, Creative Commons. If voting against plans to hand over vast chunks of your community to predatory developers now bears the name “coup”, then we need more coups. As Haringey Labour’s leader resigned this week amidst a long-running row about a proposed property development, she attacked critics for “undemocratic behaviour.” But it was Haringey Labour members who elected new candidates opposed to her plans. Momentum didn’t make the movement against the Haringey Development Vehicle (HDV); local people did. When news first broke that the deal – the biggest in local government history – was being discussed secretly, a few Labour members including concerned councillors tried to find out more. They discovered £2bn worth of public land being ploughed into a private-public partnership with little accountability or transparency and almost no resident involvement. Asking the leadership to pause failed. So instead campaigning energy spilled into vast public meetings bringing together experts (such as a UCL planning professor) with locals; 170 in Wood Green alone. People who had never been political came out, from all of the area’s diverse communities, and they contributed what they could, from graphic design and pro bono legal advice to a free nail bar at a campaign event. It’s easy to recite the Cold War playbook to attack Momentum, which despite its campaigning success is a relative unknown to most voters. It’s harder for such 80s-style red-baiting to work when there’s a concrete issue affecting real people where the left has taken a decisive role, but nonaligned community activists and much of Labour’s centre-ground have been supportive. The last year in Haringey has been shaped by an active, organised community. By Christmas a new and diverse slate of Labour candidates had been voted in. A resident-led legal challenge to the development vehicle was rumbling on, and local politicians ranging from both the area’s Labour MPs to the Lib Dems had come out against the HDV. At Labour party conference Jeremy Corbyn committed to balloting residents on major regeneration schemes, responding to a national discussion after the Grenfell Tower tragedy about how tenants are locked out of decisions. A pragmatic, responsive local leadership might have changed course. But Haringey’s leadership pressed on, attempting to make key decisions swiftly in a bid to bind their successors to the HDV. This risked running up bills in the millions if future councillors wanted to escape the deal. It was in these circumstances that Labour’s national executive committee intervened to ask the council to rethink its plans. Local government deserves autonomy; national parties aren’t set up to absorb the complexities of pavement politics. But the local party had spoken; the NEC was simply adding its clout. Memories have been roused of the 1980s, when amidst Thatcherite cuts, Liverpool’s Labour council was led by radicals who set an illegal budget. Back then, the same factions that now defend Haringey’s leaders now wasted no time in shutting it down. But there is a deeper story than Labour internal processes. In the 2017 general election, Labour won strongly in London - where the UK’s housing crisis is felt most acutely. Millions of Londoners struggle for decent housing. Long-established families are priced out of their areas, new arrivals seeking work face a rental market where vermin-infested cupboards sell at extortionate prices. We were convinced by a Labour manifesto which promised tough protections for renters, a million new council and affordable homes, and homes for the rough sleepers we see at the Tube station every day. Labour cannot in good faith propose such a programme while its councillors carve up estates and give them to LendLease. Gone are the days when it is appropriate for Labour politicians to cosy up to developers, sign off on questionable regeneration schemes, or evict homeless single mothers from their accommodation, as Newham did in 2015. Let’s be fair to Kober and her fellow travellers. They aren’t all uncaring, they feel that in an imperfect, Tory-run country the only way to get any vaguely affordable housing built is to cut HDV-style deals. Being a councillor is often a thankless job rewarded by fury whichever way you turn. But councillors shouldn’t isolate themselves and shoulder the burden alone. If they think there’s no alternative, they could listen to alternatives proposed by residents and campaigners (or to the other councils which refused to enter HDV-style schemes). With more dialogue, there would be less need for selection battles. In Labour-held Southwark it has been reported that all homes in a new estate were sold to foreign investors, as part of a development by the same firm behind the Haringey scheme, LendLease, on a site that once housed 3,000 local residents. 3,000 is also the number of unsold luxury flats lying empty across the city. Everyone recognises the situation is unsustainable. Labour councils, with the support of their national party, must get radical to survive. Governing with the active participation of tenants and residents is the first step on that road.